Cooking with charcoal briquettes may sound like a daunting or even intimidating camping task. However, the results are tastefully satisfying. We continue to say, there’s nothing like the taste of cooking in traditional cast iron, but that doesn’t even begin to cover it. Here’s a couple quick tips for those just starting out. How Many Briquettes Do I Need To Heat My Dutch Oven? The first thing you need to assess is the size of your dutch oven. 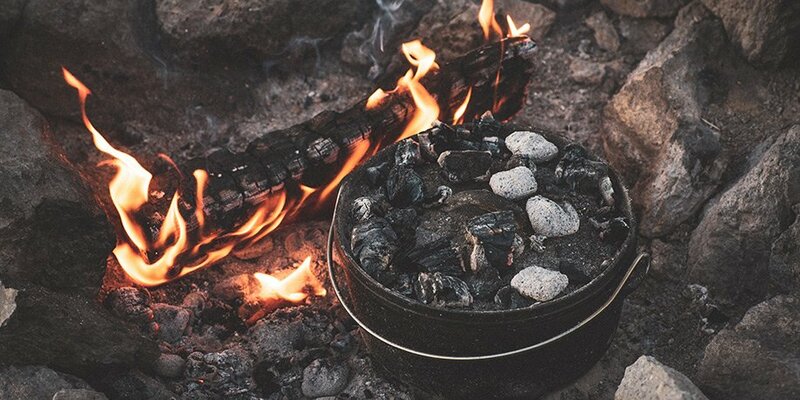 At Camp Chef there are four universal sizes which are typically labeled on your dutch oven—10-inch, 12-inch, 14-inch, or 16-inch. Bear in mind that weather, cooking methods, food, and even elevation can play largely in how many briquettes it takes to heat your dutch oven. The math is fairly simple. In order to guesstimate how many charcoal briquettes you’ll need, take the size on the lid and multiply it by two. For example, if you have a 12-inch dutch oven—12 x 2 = 24 (charcoal briquettes.) Seems easy, right? 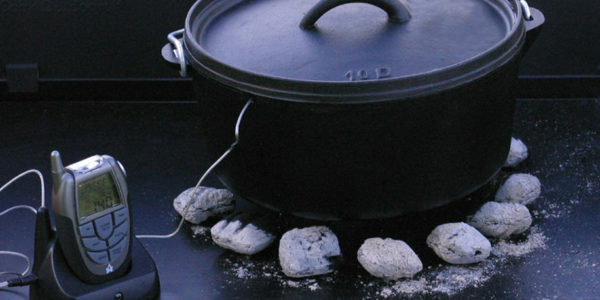 To get an even cook you’ll need to place briquettes around both the top and bottom of your dutch oven. The placement of briquettes is key. Place them on both the outer rim of the lid and directly underneath the dutch oven in the form of a circle. As we said earlier, your cooking method and dinner contents will dictate how you strategically divvy up your charcoal briquettes. Baking: Majority (75%) of the briquettes are placed on top the dutch oven and the rest (25%) on the bottom. We do this to ensure that the contents within the dutch oven do not burn. Frying/Simmering/Boiling: Majority (80-100%) of the briquettes will be placed underneath the dutch oven for a more concentrated heat. Keep in mind that you may lose a considerable amount of heat if you are placing the dutch oven and briquettes directly on dampened ground. If you plan to cook directly on the ground during these conditions try bringing a disposable/inexpensive tin pan to place underneath your dutch oven. That being said, we suggest cooking on a dry surface or even purchasing a Camp Table to assure your charcoal briquettes do not extinguish. Check out our most popular dutch oven recipes here. What’s your favorite recipe, memory, or tip when cooking in cast iron? Let us know in the comment section below! As a beginner I counted my briquettes. It was suggested that I could simplify it by not counting. Instead for baking use a full ring of briquettes on the lid and a half ring on the bottom. Easy, fast and if you count them just to check it usually comes out the same. I’ve been doing it this way for several years. Thanks for the tip, Gary!